The Society acknowledges that collaboration and partnership with industry is important, a relationship underpinned by the doctor-patient relationship. We believe that this relationship should be supported but not interfered with. Together we have a responsibility to protect the patient’s right to quality care, access to information, and privacy. At Shire we focus on developing and delivering innovative medicines for patients with rare diseases and other speciality conditions. To realize our aspiration to become a leading global biotech, our efforts are concentrated on four key drivers: growth, innovation, efficiency and people. Our priorities are to drive optimal performance of our existing products, increase patient access to these medicines and to build a pipeline through research and development and partneships in order to deliver new medicine so patients. Like The Pelvic Floor Society, new ideas, new innovations, new ways of thinking are fuelling our future. "Enabling people with life-altering conditions to lead better lives"
Medtronic & Covidien, are global leaders in healthcare development and market an extensive portfolio of advanced surgical instruments and medical devices for neuromodulation, minimally invasive and traditional surgery. Medtronic & COVIDIEN are committed to supporting a wide variety of surgical education programs for Surgeons, Fellows, Residents, Nurses, allied health personnel and other members of the healthcare team with a history of over 40 years of advanced medical training. "To alleviate pain, restore health, and extend life"
COOK Medical, was founded in 1963 in Bloomington, Indiana. Our first products were wire guides, needles and catheters. 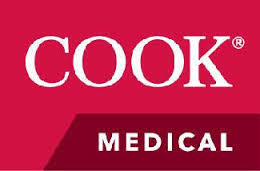 Today, Cook Medical makes over 16,000 products that serve 13 hospital lines and provides our products to 135 countries. Being a family-owned business allows us to do what’s best for the patient. It gives us the freedom to work through a problem for as long as it takes to find the simplest solution. The THD group was founded in 2007 in Correggio,, Italy to promote thire eponimous THD device for the treatment of haemorrhoids as well as its illuminated anoscopes and proctoscopes. THD is actively involved in promoting good governance in the performance of THD and provides free traing opportunities throughout the Uk by surgeons expert in the technique (See courses section). For more than 30 years, BK Ultrasound solutions have been used to improve the practice of medicine in procedure-driven markets such as urology and surgery. BK Ultrasound is part of Analogic Corporation, recognized around the world for advanced imaging and real-time guidance technologies used for disease diagnosis and treatment, as well as for automated threat detection. BK Ultrasound-branded, award-winning systems and unique transducer designs offer unsurpassed imaging capabilities that enable real-time image guidance in easy-to-use, portable platforms. BK Ultrasound systems and transducers address the specialized needs and clinical challenges of physicians worldwide.